It wasn’t anything I thought anyone would notice, let alone find interesting enough to discuss. Annie had found the filter on the side of the pool, and started to stick her arm into it. Since this wasn’t exactly the safest thing for her to do, I pulled her arm out and leaned close. The woman had asked the man why Annie said that, and the man, who had been listening apparently, told her. As they debated this it dawned on me that what I did could have been seen as a weird thing to do, like I was trying to scare the Dickens out of a toddler. And while I was trying to scare her (just enough to keep her from putting her hand where she shouldn’t), there was a bigger reason I told her there were monsters in the filter: I wanted to spark her imagination. I remember as a kid the world seemed so full of magic. Santa was real, so was a rabbit who brought you chocolate, and a woman came in the night to trade coins for your teeth. My Dad used to do things to make the world seem even more magical, and often took my sister and me on hikes behind our house into what he called The Magical Forrest. Looking back as an adult, The Magical Forrest still seems pretty incredible. It was a wooded area – perhaps a couple of miles in diameter – and in the early part of the twentieth century a number of families lived there. But then the road was moved, and their homes ended up abandoned. When I was a kid – a good forty years after the last people moved out – these homes were ramshackle, overrun with foliage, and covered with graffiti. From a kid’s perspective, however, they seemed like they belonged to another world. My Dad helped with that, of course. With each step he warned that we had to “Watch out for trolls,” and said that if we saw any elves we were to “wave hello because they might give us gold.” I literally remember seeing elves and trolls peeking around the sides of those abandoned homes. It was just my imagination, of course, but it was so exciting! I want Annie to have experiences like that too, and while saying there are monsters in the filter is nowhere near as exciting as The Magical Forrest, it’s a start, right? In defense of the woman by the pool, I can see how she might’ve thought it was creepy to tell a tiny kid monsters exist, but I had a feeling Annie would take it as I intended. The joke will be on me if she starts having nightmares, but tonight she waved me over to the window and pointed out into the darkness. I nodded and peered out with her at monsters only she could see, and smiled knowing I was helping to make her world a little more magical. That is, you know, as long as I wasn’t scarring her for life. I don’t think that’s creepy at all. I see it how you do…you’re trying to spark her imagination (and keep her out of harm’s way). I do that all the time. It’s a creative way to both distract little ones from doing something you don’t want and also spark imagination at the same. Her referring to it as “creepy” is pretty small-minded. When you started the story, I was racking my brain for ways that YOU of all people could ne creepy with Annie. Turns out you weren’t! But then I am the chick that was in her garage spray painting gravel gold early St Patrick’s day morning and blowing it dry with a hair dryer once I learned my nephew (who had spent the night) believed in leprechauns …when he left that day there was a trail of gold leading to a retaining wall. Behind the wall? The chest of gold the foolish leprachaun had left behind for him to find. Spark Annie’s imagination. Ignore the creepy people by the pool! That is such a cool idea, Out here where we live, the elementary schools ALL of them have the K-6th make Leprachaun traps, Let me tell you the lines we sooo long at Michaels and such, But this is really a cool idea and it was neat seeing the imaginations of the kids in their traps. Creepy? No. Maybe the man would have chosen a different route to explain to his toddler had he been in your place. But I don’t see what is creepy about that?! I’m all about honesty, but being honest about the danger of that is difficult with a toddler. I probably would have said something similar to my toddler as well. Some of my best parenting comes from complete lies (whoppers actually) and misdirection. Nothing wrong with suggesting monsters, not creepy at all; much more interesting! Considering my husband and I do thinks like that too, I definitely would not go with creepy. There’s actually a quote I love that says “Fairy tales do not tell children the dragons exist. Children already know that dragons exist. Fairy tales tell children the dragons can be killed.” I love this because my kiddos already think there are ghosts and whatnot out there but when my husband and I do things like what you did it shows them that we can be okay and that mom and dad are here to protect them from the monsters. And of course to run and scream and play when it’s time to play monsters! Definitely NOT creepy dad. The bottom line is Annie is YOUR daughter, you know her best. To some, the word Monster would freak them out but you knew it would be magical to Annie. That’s amazing!! I love your dad & his magic forrest. It’s too bad not all dada’s are like you two!! My mom was always TERRIFIED that one of us would drown in the pond next door when we were kids. I was in kindergarten when we moved in, but I have brothers 4, 10, and 17 years younger than me. She told them all there were alligators living in the pond and they had to stay away. Later, they remodeled the house and put a driveway very near the pond. My youngest brother, who is now 13, was very scared of what he called “the Liongator.” (Not sure how the alligator morphed into a Lion/Alligator hybrid…) He would sprint from the car to the house if we used that driveway until he was probably 9, as to not wake the Liongator, of course! We were also told there were crocodiles in my grandma’s basement because they wanted us to stay away from the steep stairs. There was no harm done. Two of the great things I remember my aunt telling me when I was a kid — breakfast is great any time of the day and that “little people” lived in the 8 track tape player. How is that “creepy” compared with the Tooth Fairy, Santa, Easter Bunny, etc.? I told my son that Santa didn’t like the neighbor kids because they were bad. That’s why – I said – they told him that Santa wasn’t real. Because he never comes to their house. Ok, THAT is funny. Nice way to get back at the little twerps. Aren’t kids told anymore not to ruin it for the littler kids? You’re not a creepy dad! They were inexperienced, anyone who has kids would have admires your distraction technique! I don’t know if “creepy” is the right word, but please be careful! As as child, I never stayed in bed. So my dad said that there was a monster living under the bed; so if I tried to get out of bed at night, he would grab me by the ankles and pull me under. He was a nocturnal monster, so he was sleeping during the day and thus, I could move around without issue during the daytime. This was freaking traumatic. It got my imagination going, all right — but not in a good way! I was terrified of getting out of bed to pee at night, so I remember going in my night diaper and later, when I was older, I would stay awake holding it (and often crying) for hours until the sun came up and the monster went to sleep. Even now, I absolutely cannot stand beside a bed with a space underneath — it gives me the heebie-jeebies. (Beds with the drawers underneath are okay; there’s no room for the monster.) As an adult, I take a running leap onto the bed. I cannot walk up to a bed. No way, no how. I was about Annie’s age; I recall I was still in diapers. I also have a toilet aversion. I absolutely hate toilets and the cover MUST remain closed at all times. My dad also told me that there was a monster that lives in the toilet and he eats pee and poo (it was a potty training tactic…feed the monster.) Of course, I was terrified that the monster would stick an arm up through the toilet hole and grab my bum! I get the heebie-jeebies every time I go. And cleaning the toilet or keeping the seat up or vomiting into the toilet (*shudders* The monster would grab my face!! Ack!!) are absolutely out of the question!! So while I love that you’re trying to keep her safe and encourage her to use her imagination, be careful with the monsters!!! I’d come up with something less potentially frightening! You are not creepy in the least little way. But I have to agree with Madi. The word monters is not a good one for little children. I’ve always found that the truth is more powerful. Like that thing will hurt you, Annie. Hopefully the monster thing will be ok. But as a grandmother I would not use that word again Mike. And I say that in the most loving of ways. That’s a more valid concern than just “Why use monsters?”. I do agree it depends on the kid. I was one of those kids whose imaginations ran away from me, too. My mom and dad didn’t have to use monsters to dissuade me from doing things, because I invented them without their assistance. I remember one night I had decided that the wind outside my bedroom window was really the previous owner of our house’s ghost who was crying because she wanted to come back into her house (Thanks next door neighbor, for telling a six year old that the woman who owned the house before us died in it… that’s a swell thing to say to a six year old! ), and my mom pretty much had to sleep in the bed with me to “protect me from the ghost”, just so I would sleep that night. We talked about it in the morning, and while my mom could not convince me that ghosts didn’t exist back then, we managed to come up with a plan to make the ghost go away. I also believed that there were streets in my town that taken at the wrong time led you to a different world, and once upon a time had a nightmare that I lost my best friend in one of them. It took going to visit him at his house the next morning to convince me that trolls did not steal him away! That being the case, I am super extra careful about what I tell my daughter when I don’t want her to touch things or mess with things that can hurt her. Right now “don’t touch that, it can hurt baby and that makes mama and baby very upset!” seems to work well enough. I realize that at some point she’s going to want to do things precisely because I am saying no, so I’ll have to figure something out. But I’ll try to stay away from the monster card, just because my kid’s already the sort of kid that has to cry for mom and dad to make sure they are still there when she wakes up alone in her crib. That said it, it sounds like Annie has yet to envision monsters as bad creatures, and I hope it stays that way. I’d say to just be prepared, though, that she will not always think of monsters as funny if dangerous things. i do hope you are leading a very creative and fulfilled life right now. that is so awesome for your imagination, and that your mom went with you on it. If only. The closest I’m going to get to creative at this point is in convincing my grad school advisor that there is a future in researching the educational benefits of play in older kids (not just tots) even in this climate of “accountability”, and spinning a dissertation out of it. It’s definitely going to require a lot of creativity to pull the whole thing off. When I was little, we did a lot of road trips with my dad. He used to say that we were on an alien planet and all the other cars and trucks were aliens, so we had to hide (duck) or shoot. We deciphered the signs (“Checkerboard, checkerboard, checkerboard, THAAAAAAAAT WAY!”) and spent hours imagining all sorts of odd landscapes, plants that tried to grab the car and such. It was so much fun and when we went to Canada, he did the same thing with my boys, who instantly got into it. That wasn’t creepy at all. I think it was a stroke of brilliance. Well, from a child development point of view, small kids cannot grasp why they shouldn’t do certain things, like run in the street or put their arm into the filter of a pool. You can tell them why… because you will get hit by a car or because your arm could be hurt, etc. but they cannot really understand that. You have to get it down to their level, their experience to understand. Frankly, unless you are telling your child about monster JUST to scare them, you’re OK. Little kids understand much better if you say “don’t run in the street because you will have to go the hospital and get a shot”. In their world, they have experiences shots and know they hurt. They have not experiences being hit by a car, so they do not know that that will also hurt. Same with your monster in the filter… not at all creepy. And like you said, has the added benefit of sparking imagination in her which is even better! You are a great dad… not creepy! It would have been creepy if Annie were terrified of monsters. I wouldn’t even say creepy, I’d say kind of mean. Was the couple older?? I ask because I had people react to me in a similar manner. My oldest was addicted to her pacifier. We called it her Nuk. Creative, I know. Anyway, I’m not even gonna admit how old she was when I finally put my foot down, but when I did, I spun a fabulous tale of the Nukie Monster. He comes and swipes pacifiers from toddlers who are too old for them. She thought it was the funniest thing, and loved looking out the window for him at night. She even saw him once! Haha! It worked and everyone was happy……but for the older generation of the family who all believed I was awful and had scarred the kid for life. Kids these days have the Sesame Street monsters, my oldest had Monsters Inc, etc, etc. Monsters are fun, silly, mischievous…..maybe our idea of monsters and nosey bystanders’ ideas of monsters are different. And besides all that, whatevs. You’re, like, one of the best dads ever. I can tell these things. I had one and I’m married to one! I that was considered creepy, then my mom’s “attic boofer” probably bordered on child abuse. We have great stories to tell as adults now and we all get a laugh out of it. I love your magical forest story. Kudos to you & your dad for great imaginations. If Annie’s cool with it, then that’s all that matters. My oldest, nearly 4, would probably have trouble sleeping if I said that, but that’s just because he’s read too many Monsters are Everywhere books! He thinks they might live in his closet, so we keep that door closed. I love that you and Heather are always expanding and enhancing Annabel’s imagination and creativity – it’s wonderful and most certainly not creepy. The woman may think differently if and when she has her own children or nieces and nephews to enjoy and bring the magical world of imagination to life. You know Annie – if it was really going to scar her, you wouldn’t have said it. Not creepy at all! I’m all for sparking the imagination, too. Kids need magic. I agree. You know Annie; you know her personality and how she reacts to things. I think this is the key here. You wouldn’t have said it if things like monsters upset her. Are you sure the woman did not mean ‘creepy’ as in monsters in a filter sounds creepy versus that you were creepy? I took it that way when reading your story. I don’t think creepy is the right word at all. I think the word she was looking for was “mean,” perhaps. But I don’t think it was mean, either. I think what you did was playful and cute. If you’d known Annie was easily scared or already had a fear of monsters, it might have been on the mean side, but Annie isn’t that kind of kid. Of course, a person who doesn’t know either of you wouldn’t know that. Which is why you shouldn’t judge people or actions for which you have no context. Not creepy, Mike. Keep being awesome! I agree with you, it adds to their childhood to have their imaginary world. I did find that I had to make sure to spray my son’s room with “monster repellant” (water) before bed when he got a little older and was afraid of them. He outgrew that with no permanent psychological damage. Not long after we moved away some land developers put track homes where the magic used to be. I LOVE the way you always strive try to make her childhood the BEST ever! I have always told my 3 boys that wax in their ears and boogers in their noses were bugs. It would start when they were little and I’d tell them I would have to clean their ears to get the bugs out! The 19 and 14 year old are over it but the 9 year old still asks me to get the bugs out. My MIL has always thought I was terrible for teaching them that. I always find parenting differences and dynamics so interesting. I don’t think it was creepy at all, because like you said, you think Annie interpreted it the way you intended, not to freak her out, but to know to stay away AND have some imagination. Had that been my husband, he would have explained what a filter did and why she couldn’t play near it. He uses every chance he gets to teach something… and because of it, our two year old has a grasp on things that I would never have expected. And not creepy at all. My Niece was the only girl with 8 nephews, and my son who was closest in age with her, told her that monsters came to eat her toes at midnight, (they were like 5 and 7 at the time) She was up till like 1 am for 3 nights in a row before my sister in law figured what was happening, and called ME at 1 in the morning, there was no talking to her and telling her that Connor was joking with her, so the following night I made Monster spray (Water with a few drops of fabric softener) and at bedtime we went and sprayed her room, under the bed, in the closet, drawers, etc…. and left the bottle on the night stand in case we missed something, But she slept through the night. She passed on April 4th 2011 at the age of 15 due to tumors that grew in her brain, and I cherish these memories of her. As for Annie, You and Heather would know if the using of Monsters would have freaked her out, and then you would have figured out a different way to deter her from the filter, she is groing up to believe in the magic of Princesses and Kings, and I bet she would be total princess overload at Disneyland right now. I think it’s “creepy” that they were so intent and interested in what you were doing. Wow! People need to mind their own business and live and let live! Love this! We have fairies that live at our cottage. They moved there from the family farm in the UP where my great-uncle would hide pennies and sticks of gum in the wood pile. Now they live at the cottage where my children get small gifts from the fairies who hide them in the rocks when we visit. My son loves fairies. With the monster thing – there was a little girl here in MN who get stuck on a pool filter a few years ago. Her intestines were pulled out of her body by the force of the suction – she lived only for a short time after that. So, to me, saying monsters live in a pool filter is actually very close to the truth. Our world is full of real and pretend monsters, fairies, trolls, and other types of “magic”. Embracing it is a great way to help our kids understand the world. oh my god, that is an AWFUL story. i kind of want to know how that happened…but also find it very very very disturbing. My kids, 4 and 2.5, love pretending. And mostly pretending that monsters, vampires, werewolves and ghosts are chasing us. I get some raised eyebrows when we’re in the grocery store and on of the kids shout. “look! A vampire is coming!”but I don’t care. My kids became obsessed with all things spooky since Halloween. I was the same way as a child and have good memories of my dad pretending with me. If its considered creepy, well, I’m happy to be creepy. I think it very much depends on the child. You know Annie, and she loved it. Good enough for me! When I was about six or seven, we took a trip to Boston. The manhole covers were steaming in the winter cold. I asked my dad why the manholes were on fire, and he told me that dragons lived under Boston, and much like they breathed fire, they also pooped fire. The steam I saw was actually smoke from the steaming dragon plops, and the manhole covers were vents to keep Boston from going up in flames. It had both of us in tears, we were laughing so hard. My mother was unimpressed. It’s been twenty years, and steam from the sewer is still referred to in our family as ‘steaming dragon plops’. Gross, but a great spark for the imagination. Awesome story, Kayt. I could picture it and thought it was hilarious! That just made me think of so many childhood things. When we were kids there was a place of pine trees, it was like a maze and we called it “The Land Of The Trees”. We would play there for hours. The adventures we had. There was monsters and many other imaginary things. But just maybe they weren’t imaginary! We also use to play in hippie village, it was a place from the 60’s that was a bit of a ways out of town. Our parents were always scared that we would fall in the large holes that was dug to grow their weed in. I think we went there because they told us not to. It was a really neat place. They also had their own little cemetery. That was creepy. It was turn down by the loggers years ago. Not the cemetery that’s still there. I have done the very same thing to keep my toddlers from wanting to open the door to the basement which contains a very steep set of dangerous steps!!! I told them monsters lived in the basement and we didn’t want to wake them up during their nap! It was magical to them and they’d always whisper good night to the monsters behind the door! I always thought there were mystical serpents in my Grandma’s pool filter cover, I never put my arms in there; well only once anyways! Whatever works for you and Annie! You know her best and it was not at all creepy. Some of my best memories are the crazy things my mom use to do or say when I was a kid. I remember one trip down the highway when she randomly beeped the horn (going 55 mph) and when we ask why she told us a family of ducks was crossing!!! She would also make my cousin and I point at the garage door with one hand and push our noses with the other so the garage door would open!! If that isn’t magic, then I don’t know what is!! Hey, there are monsters out there. Even though they aren’t the kind from Monsters, Inc. It’s harmless if you ask me. It helps her use her imagination. Nothing about what you said to Annie was creepy. I think it might have just been a poor choice of words by that woman. That being said, I’m not entirely buying your explanation about why you told Annie monsters live in the pool filter. You clearly didn’t want her putting her arm in the filter and told her something you felt would scare her enough to stay away from the filter. Telling her that monsters live in the pool filter to spark her imagination doesn’t make sense. Sparking her imagination is likely to make her more curious about the pool filter and want to explore the filter even more given the chance. In reality, your kid was doing something you felt was dangerous and you told her what you felt was appropriate for her age/understanding to get her to stop sticking her arms in the pool filter. Nothing wrong with that. Someone judged your parenting technique and I think you felt it necessary to make excuses for the monsters-in-the-pool-filter comment. Anyway, that’s my take on it even though I could be way off base. I mean no disrespect, but I figured since you put it out there and are allowing comments, I hope it’s okay that I put in my two cents worth. I remember when my son, who is now 12, was about 4 and terrified that monsters were going to come into his room at night through is window. So to make them seem less scarey and to get rid of them, I told him to tickle them as they hated to be tickled. He thought that was funny. It didn’t make them feels so scarey anymore for him. It worked. He slept good after that. I don’t think it’s so bad if you make it somthing fun for the kids. Please each kid sees things differently and you are her father know what’s best for her. I think the couple listening and talking about you is creepy!!! Awww this story warmed the insides of my cold heart I LOVE that you sparked her imagination out in the world. And Mike-your childhood sounds SO AMAZING. i got all sad and nostalgic thinking of how sweet it was of your dad to take you on these adventures. I wonder if that is more of a "normal" thing parents do in today's society? I know it certainly wasn't like that for me. But glad to hear everything is going ok for Heather! She seems rather positive about the outcome; well as positive as one can be in this situation. I truly hope you guys fill your lives with tons of babies because you all exude such a life force, and joy. I can only think that the more kids you have, the more joy you will be surrounded by, and to help dampen the pain of losing Maddie. 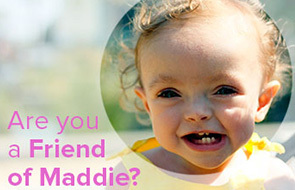 Not that she'll be lost in the recesses of your minds, because i'm sure you guys will always have pictures and video of Maddie displayed around the house and open to talking about her. I can only imagine how hard it must be to see Annie going past the developmental milestones that Maddie should have made Completely breaks my heart. you should hear what i say to get my toddler to look both ways before crossing the street! the monster that lived in our pool filter was named Oscar – i loved it when the my swim lesson teacher told us about him and said ” say hi to Oscar – he wont come out of his house, but never put your hand in there!” i was probably annie’s age. it was fun!! Every time we go to a hotel with a pool filter that has one of those round white lids on the side of the pool (like a manhole cover), my husband always sneaks his hand in and rattles the top. It’s the “crab pot” and crabs live there who like to pinch soft, yummy, delicious little girls–so don’t go near it! You can then spend half an hour playing crab pot and squealing and trying to plot how to get past the crabs (they really like toes, you know). My girl – same age as Annie – loves to be scared. Her favourite books is going on a bear hunt and we have told her the bear is sad at the end because all he wanted was a cuddle or a tickle. She often wakes up and tells us the bear tickled her awake! We finally watched Beauty and the Beast with her last weekend. Several times she landed in my lap saying “too scary” and peeking out from her fingers. She didn’t want it turned off though! The other day she galloped her pretend horse around the table, waving her sword (butter knife) over her head. She was off to rescue the princess and wake her up with a kiss and cuddle! My point is that imagination is a wonderful thing. And fostering that spark of magic is important. And the bear gives her a word to use when she is scared of something she can’t name, like a windy night or an upset tummy – she tells us the bear is there and we know it’s time for cuddles and reassurance. I so wish Grace and Annie could meet – Annie would be the princess and Grace her rescuer! I don’t mean to scare you, and there were safety protocols put into place after little Abigail’s accident, but it’s still a safety issue. Well, I guess I was lucky enough to have a creepy dad. Back in the early 70’s when I was a tot we believed in the “boogiewoman” (equal opportunities for boogiemen and boogiewomen at our house). We blamed all sorts of mischief on the boogiewoman – she was the one that made the toilet seat cold in the middle of the night, little things like that. I wasn’t scared of her (which I’m sure was my dad’s point), it was just something funny between my dad and me. I don’t think that’s so bad! My daughter is two and she thinks monsters are neat thanks to Sesame Street and Monsters Inc.